This is a really lovely original M35. In many instances, helmets that had seen several years of use needed to be refitted with new liners, chinstraps and paint, Prewar M35's that originally had smooth factory paint were usually refinished in a paint more suitable for concealment in combat. This is a classic re-issue in a dark fieldgrey. The liner is the original mid-war factory fitted liner, the rivets and air vents have never been removed and are nice and tight as per factory. The helmet has saw remarkably little wear after reissue and may have been a depot find. At first glance the chinstrap appears to be a reproduction. I got this chin strap from a Polish wz31/50 which had been factory refinished post war with a surplus German liner and chinstrap, so I suspect it may be original but can not guarantee that without expert advice. There is clearly a flat area on the paint for a decal to be fitted, however there appears to be little evidence of a decal ever having been there. Possibly it was factory refinished in August 1943 just as the order to no longer apply decals was issued. 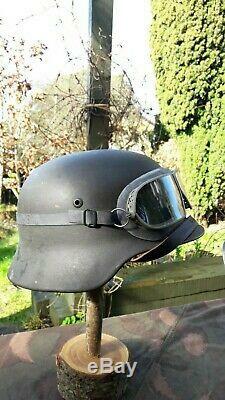 The helmet is stamped ET66 showing it was made by Eisenhuttenwerk/ Thale. Its stamped with the lot number 3542 at the rear. This is a very splendid example of an M35 stahlhelm and would be a great. It is 100% original and in fantastic condition. Check out my feedback, I only sell genuine stuff. 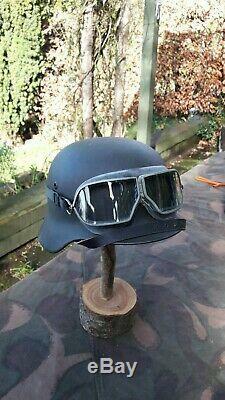 I'm throwing in the Soviet M38 googles just because I think the helmet looks pretty cool with them on. Check out my other items. The item "WW2 German Helmet, M35 original mint condition size 66/59" is in sale since Sunday, March 10, 2019. This item is in the category "Collectables\Militaria\World War II (1939-1945)\Helmets/ Hats". The seller is "el_cid71" and is located in Belfast. This item can be shipped to United Kingdom, Austria, Belgium, Bulgaria, Croatia, Cyprus, Czech republic, Denmark, Estonia, Finland, France, Germany, Greece, Hungary, Ireland, Italy, Latvia, Lithuania, Luxembourg, Malta, Netherlands, Poland, Portugal, Romania, Slovakia, Slovenia, Spain, Sweden, Australia, United States, Canada, Japan, New Zealand, China, Israel, Hong Kong, Norway, Indonesia, Mexico, South Korea, Switzerland, Taiwan, Thailand, Saudi arabia, United arab emirates, Ukraine.